Where She Went by Gayle Forman. Grades 8+ Dutton Juvenile, April 2011. 262 pages. Reviewed from ARC snagged at ALA. It's been three years since Mia's accident. Three years since everything changed for Adam. He got Mia to stay... and then she walked out on him forever without even telling him why. A lot's happened in those three years. Adam channeled his pain into a new sound for his band Shooting Stars and that album catapulted them into superstardom. But somehow getting what he's always dreamed of isn't as great as Adam thought it would be. He's on the outs with his bandmates, popping pills to control his anxiety, and still nursing bruises from Mia's betrayal. And on one fateful night in New York City, as Adam faces yet another grueling tour, Adam will see Mia again. And maybe start getting some answers to questions he's held for far too long. Yesterday, I talked about the audio recording of If I Stay, which I listened to in order to refresh myself on Mia's story before diving into the sequel. While I think that Where She Went could stand alone, the emotional punch it packs is definitely amplified if you're familiar with Mia's story. From the first chapter, Adam's anguish is plain to see. He's a famous rock star, he has a movie star girlfriend, and he's living his dream! But Adam is dying inside, racked with anxiety and hopelessness. He feels trapped everywhere he turns. He feels all alone in the middle of one of the biggest cities in the world. Just as in If I Stay, chapters alternate between Adam's present and his recollections of the past, his memories of Mia and the events that brought him to this desperate point. The present chapters all start off with Adam's song lyrics from the album that he wrote after Mia left him. These small snippets demonstrate Adam's intense feelings of betrayal that after he fought by Mia's side, after he pulled her back from the brink of death, she would abandon him. It's something he can't let go, something that still affects his every move, even three years later. That raw grief and anger and confusion is what struck me most about this book and continues to stick with me. We definitely get Adam's grief, anger and confusion. As the night wears on and Adam and Mia begin to have real conversations, we get Mia's, too. As much as this is Adam's story, it's still very much Mia's story. Their stories are inextricably woven. One would not exist without the other. The more I think about Where She Went, the more I love it. It's about what happens after. It's about no happy endings. It's about feeling grief that you don't even understand and can't let go. Highly recommended. Read If I Stay first (you'll thank me). 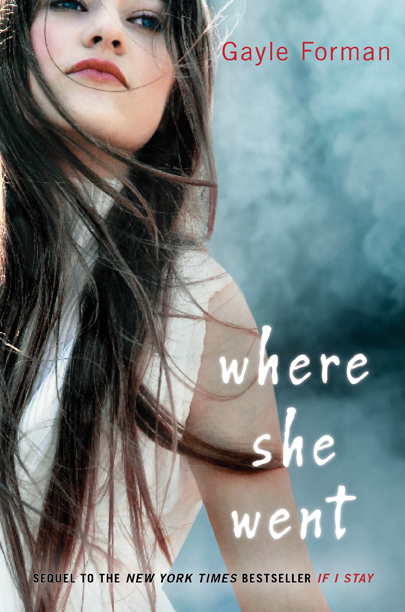 Where She Went will be on shelves April 5.